The Cornesti Orphanage in Moldova—eastern Europe’s poorest nation—is a heart-rending place. It is state-run, underfunded and understaffed. Over a hundred children are crowded inside an old building that still bears the communist hammer and sickle on its exterior wall. Because of an inadequate sewer system, a foul smell permeates the entire building. The food is poor and mostly starch. Many of the children are dirty. The female staff who serve them are overwhelmed. No child should live in such a place. Thankfully, two people who are full of Christ have felt His heart for the orphans at Cornesti. Romanian missionaries Ghiorghi and Christina Cazacu have been doing everything they can to make life better for the children there. They’ve repeatedly brought shoes, clothing, nourishing food, and the gospel. Our team of ten who visited Cornesti in July added to some of that blessing with suitcases full of clothing and stuffed animals. On a cold evening in Romania, a little baby named Christina Tipa was placed by her grandmother on a bed that sat beside a wood-burning stove. She wanted Christina, who was not yet one year old, to stay warm while she slept. Tragically, however, Christina rolled off the bed during the night, landing directly on the stove top. By the time her grandmother pulled her screaming granddaughter from the stove, one side of Christina’s body was severely burned. Doctors did not expect Christina to live, but they did what they could. When gangrene was discovered in her left arm, they amputated it right below her elbow. The infection was not contained, however, and so they had no choice but to amputate the remainder of her arm. Months later, Christina’s young father died of tuberculosis, leaving her and her mother in desperate poverty. In their vulnerability, they became prey to criminals who, seeing an opportunity to profit from Christina’s handicap, abducted them both. Each day their captors would place little Christina on public sidewalks to beg—with her shoulder exposed—and a sign was hung around her neck that read, “Please help me buy a prosthetic arm.” They would watch from a distance and empty her cup when it was full of money. Moving from city to city in eastern Europe to avoid arousing suspicion, Christina’s captors enjoyed their profits while keeping her and her mother terrorized. Years went by. Both mother and daughter once succeeded in escaping, but their captors found them again, and before Christina’s eyes they brutally murdered the person who had helped them escape—a legless man whom they were exploiting in the same way as Christina. Then, as Christina watched in horror, they severely beat her mother and later dumped her body, believing she was dead. She survived, however, and lived long enough to tell authorities and her sister—Christina’s aunt—of their ordeal. Unfortunately, Christina’s captors escaped apprehension and continued moving her from city to city, living off the money that compassionate pedestrians dropped into her cup. When Christina was seven, her aunt was shopping in the city of Odessa, Ukraine. She noticed a young girl without a left arm begging on the street and began questioning her, certain she was her niece. She called the police and ultimately was able to take Christina home with her to Moldova. How I wish that were the happy ending to this tragic story. Christina’s aunt, however, placed her in the Cornesti Orphanage. It was at that orphanage that Christina was noticed by Ghiorghi and Christina Cazacu, who were moved with compassion to help her, especially after they heard her story. They led her to Jesus and became her advocates. Just two months ago, Christina received her new prosthetic arm. And she has since moved in with her aunt, whom Ghiorghi and Christina are evangelizing. Our team of ten got to know Christina at a Christian summer camp for poor children, which is largely funded by the Cazacu’s ministry. Christina has a very precious spirit, and she is a follower of Jesus. We all fell in love with her. Still, one problem remains for Christina. Because of scar tissue from her burn, her left leg is not developing properly and is almost half the diameter of her right leg. When she bends her knee, her knee cap moves far to one side because of pressure from the inflexible scar. She needs skin grafts on her leg and left torso that will enable her to develop normally. I promised Christina that I would tell my friends about her, and that we would help her with the money she needs for surgery. For that, I received a very long hug. A happier ending is in sight! Eight years ago, Ghiorghi and Christina Cazacu adopted a little Romanian orphan girl named Nicoletta who, like Christina mentioned in the previous article, had been severely burned as a baby. The left side of her face was very disfigured and some of her fingers were fused together. To date, Nicoletta has endured surgery and skin grafts twenty-four times. She is now 14 and very happy to have a mother and father. It was always Ghiorghi and Christina’s dream to adopt Nicoletta’s three younger siblings as well, and last year, after lengthly legal proceedings, their dreams came true. Their family of three grew to six with the adoption of Hadasah, Leah, and David (new names that they each chose for themselves). Finally, the Cazacus adopted a beautiful baby boy named Daniel. Their family of five adopted orphans has become the first of three existing “Homes of Hope” in Eastern Europe. While traveling across Moldova, our American team was blessed to visit one of the other two “Homes of Hope.” There we met ten-year-old Boris, who previously lived at the Cornesti Orphanage. Boris’ mother had abandoned him, and his drunken father chained him every day to a dog house while he was getting drunk elsewhere. At the Cornesti Orphanage, Boris had cried in Ghiorghi’s arms, saying that he had no mother or father to love him. Ghiorghi vowed that he would try to do something for Boris. As a result, Boris is now being adopted along with five other children by a Moldovan pastor and his wife. Ghiorghi and Christina’s ministry is funding the building of their new house in the Romanian village of Meleseni (see photo above), where there is no existing church. That new house is thus not only a home for a pastor, his wife, and their six newly-adopted children, but is also a meeting place for a house church in a village where there was no gospel witness. And the very same thing is being done by a pastor and his wife and their three adopted orphans in a third “Home of Hope” in Transnistria, a little-known nation that lies between Moldova and Ukraine. All of this is because of Ghiorghi and Christina’s example, influence and support. The greatest hindrance to orphan adoption by Christians in Eastern Europe is their poverty. Believers who are willing to adopt orphans can’t afford the simple day-to-day expenses. Through our Orphan’s Tear division, however, we’re partnering with Ghiorghi and Christina to help connect monthly sponsors to the children living at their Homes of Hope. If you would like to “adopt” one of the Home of Hope children with a $20 per month sponsorship, that will go a long way to supplement the costs of raising a former orphan in Eastern Europe’s poorest nation. If you are already sponsoring a child elsewhere through Orphan’s Tear, perhaps you will want to add a Moldovan child to your “portfolio.” Just go to Orphans Tear, and then select “Moldova”, to learn more about the children’s stories. Thanks so much. A common sight in Romania and Moldova: Permanent picnic tables in a graveyard, used to eat meals with departed loved ones on certain days prescribed by the Orthodox Church. As I met with pastors during our time in Romania and Moldova, I repeatedly heard stories of the persecution that they face, and the source was always the same: Romanian Orthodox priests. Romanian Orthodoxy is deeply ingrained in the culture, and evangelical Christians are considered to be a sect. The derogatory term for them in Romania is “the repenters,” a slur that is actually quite complimentary. Quickly looking to the Lord for wisdom, Viorel asked the priest to also read Matthew 23 from the same Bible for everyone’s benefit. The priest turned to that chapter, read it silently, and then said, “I am not your personal secretary to read at your bidding!” So Viorel asked if he could borrow the priest’s Bible to read Matthew 23 to the crowd, to which the priest, feeling the public pressure, acquiesced. When Viorel finished reading Jesus’ denunciation of the scribes and Pharisees, the crowd ordered the contingency of priests to leave, threatening that they’d stone them if they didn’t! After that, Viorel said that he preached to the crowd until midnight! A church was birthed in the village of Tatarasti! Three pastors with Romanian copies of TDMM. The one on the left is soon going to Turkmenistan as a missionary. I was blessed to share the Word at two pastors’ gatherings and hand out copies of the Romanian translation of The Disciple-Making Minister, which is now in its second printing. I was also blessed to listen to a number of testimonies from pastors and others of how they have been helped from reading its thirty-three chapters. Doors continue to open for its distribution across Romania, Moldova and Transnistria. One Romanian pastor even told me how he’s taken scores of copies with him to Italy to give to Romanian-speaking Christian leaders there. Thanks so much for helping us equip pastors around the world. When we started the Orphan’s Tear division of Heaven’s Family three-and-a-half years ago, our intention was very simple. 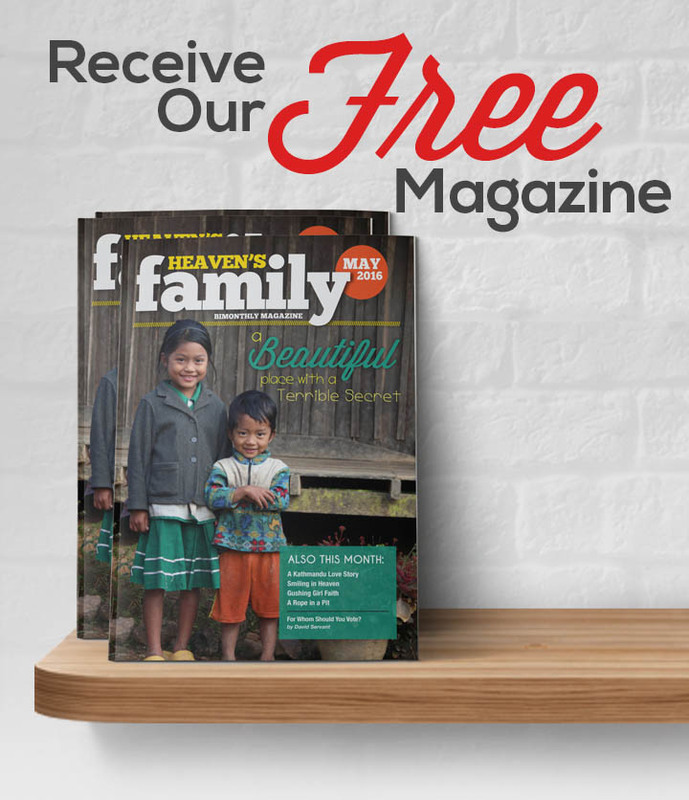 We wanted to find monthly sponsors for children in impoverished Christian orphanages in Myanmar so that we could help them have adequate food and clothing, along with Christian nurture and an education. We never dreamed of building orphanage dorms, although the orphanages that our children were living in were very inadequate, mostly built of bamboo. God has proven Himself, however, to be the “Father of the fatherless” (Ps. 68:5) So far, we’ve built solid brick dorms for thirteen of our orphanages, and we’ve purchased houses that serve as dorms for five others. Beyond that, we currently have buildings under construction (or about to start construction) for nine more orphanages, and we’ve purchased land for four others with the intention of building new dorms for them. We’ve also provided bathrooms, wells and kitchens/dining halls for many. Through hundreds of people, the Lord has provided hundreds of thousands of dollars for all of these projects. We are amazed and thankful. Due to the summer slowdown, some of our orphanage construction projects have been halted, and we’d like to get them started up again. These projects that provide adequate and safe shelter for little followers of Christ all fall under the category of “I was a stranger, and you invited Me in” (Matt. 25:35). Thanks to all who have shown their love for Jesus in this way. Glad to be in our family: Saltinat Chongmaroonova, reborn one month ago, with two of her grandchildren. There are no other people on the face of the earth whom I admire more than missionaries who have left friends, family and comforts to serve Jesus in a foreign land. Too often, however, missionaries are not esteemed by the church as they should be, as modern-day apostles. Rather, they feel like Paul, who described himself and other apostles as “the scum of the world, the dregs of all things” (1 Cor. 4:13). I recently heard a story of some people who sent not only their worn-out clothing to some missionaries (“good enough for them”), but also included their used tea bags. One of those whom the Careys have won to the Lord is Saltinat Chongmaroonova, pictured in the photo above. She was abandoned by her husband many years ago and lives with her daughter, also abandoned by her husband, and her two grandchildren. Living in material as well as spiritual poverty, her heart was melted by the love of Christ as she received much-needed practical help from the Careys. She now regularly attends their house church and was publicly baptized just a few weeks ago. Thanks for being part of her transformation. The Disciple-Making Minister recently reached a publication milestone with 100,000 copies now in print in twenty languages. Most have been given to pastors in poor nations, but TDMM is also finding a readership among Christians and Christian leaders in wealthier nations. You can order your own copy of The Disciple-Making Minister online. The small staff of Heaven’s Family is busier than ever as we do our best to keep up with growth that has averaged seventy percent each year over the past five years. We are in need of additional team members who not only have a heart after God and a love for the “least of these” among Jesus’ family, but who also possess administrative or communication skills, such as writing, editing, graphic/web design, photography and videography. We also need a grant-writer/director of development as well as associate ministers. Positions are open only to those who can be self-supported, but we can help with that process. If you are interested, please email us at info[at]heavensfamily.org .